Glo Germ™ Kit is rated 5.0 out of 5 by 1. How clean are your hands? This kit is excellent for teaching aseptic techniques such as proper hand washing and surface cleaning. Kit includes a battery-operated LED UV lamp, an 8-oz bottle of Glo Germ™ Liquid, and a 4-oz container of Glo Germ™ Powder, all packed in a plastic case. How clean are your hands? 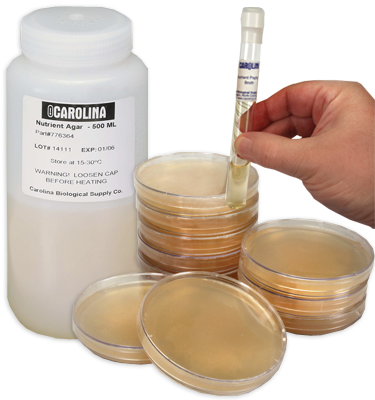 This kit is excellent for teaching aseptic techniques such as proper hand washing and surface cleaning. Apply liquid or powder directly to hands or to a work surface. The student works through a normal cleaning routine and then views the hands or surface area under an ultraviolet lamp for remaining "germs." Kit includes a battery-operated LED UV lamp, an 8-oz bottle of Glo Germ™ Liquid (item #154681), and a 4-oz container of Glo Germ™ Powder (item #154682), all packed in a plastic case. The lamp uses 3 AAA batteries (included) and is 3-3/4" long. No electrical outlet is required, so the kit can be used anywhere. The wavelength of this ultraviolet light is not adequate for germicidal use. Rated 5 out of 5 by ejg1 from Excellent demonstration product all ages Our local public health department purchased this kit from Carolina and made it available for use in schools. One of our student teachers brought this to school to use in a demo sharing session for fellow candidates and science staff. I observed the effect on young children, 25 year olds and older science staff. Even though science teachers thought they were washing their hands correctly (or that sanitizing gels would protect them), it was clear that most adults do not wash properly. The black light reveals areas that are often missed: wrists, finger webs and under the nail beds. And it glows in the dark- how cool is that!? While I teach secondary school, I could see this simple demonstration as extremely valuable to teach elementary students why and how it is important to wash their hands to prevent infection and protect their community. Highly recommended for any unit that discusses microbes!